Physical activity is crucial for leading a healthy life. A man sitting on a couch with a bucket full of chicken legs and fries is only inviting trouble. He is gaining weight due to his inactive lifestyle. Physical activity is the movement of the body. The body uses energy and it is physical activity. Being active is key and you can be active by walking, playing a sport like cricket, hockey, kabaddi or soccer, jogging, running, climbing the stairs, dancing, jumping and many, many more. There are moderate as well as vigorous physical activities. Moderate physical activities – dancing, tennis, water sports, walking, gardening and bicycling. Vigorous physical activities – fast walking, running, swimming, basketball, tennis (singles) and aerobics. You can choose from these different activities as well as switch between vigorous and moderate. You have to remember that only moderate and vigorous activities are counted as physical activities. Physical activity helps you live longer as your metabolism works great and your organs are healthier compared to a person who is not into physical activity. You have stronger bones and muscles when you indulge in physical activity. People who are active also feel confident about themselves as well as their body. Physical activity helps in keeping you active and alert. Playing a sport helps in concentrating on the task at hand. You are able to give your all to your work. When you actively involve yourself in sport or any other physical activity you sleep well at night. You are able to keep a check on your weight. Physical activity peps up your mood and you are not depressed. So, what are you waiting for head to Garg Sports International, here and choose from the top-class physical activity equipments and enjoy. Is Sports Education As Important As Academic Subjects In Schools? 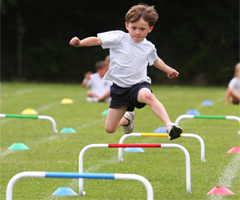 Sports education or physical education is a part of the curriculum in schools across India. However, it has been observed that it is a mere subject and schools don’t pay much attention to the same. By providing physical education in educational institutions like schools, children and young develop life skills. The question lies – is sports education as important as academic subjects in schools? Decrease in the money and resources provided to the team taking care of physical education in a school. Academic education and sports education complement each other. In fact they are the two sides of the same coin. When sports education is an active part of the academic curriculum, the overall personality of a person improves. It develops the qualities of team spirit, leadership and tolerance. It instils the habit of discipline, determination to forge ahead and will power. Physical education drives students to win no matter what the circumstances are. It develops the spirit to never give up. Physical education teaches students the importance of hard work in life. Hard work is important in not only sports but in all other walks of life. It helps in getting the students fit and healthy. By taking parts in sports activities, the students learn the importance of being healthy and fit. The students adopt a better lifestyle which is not lazy. Sports education along with academic education is crucial for the complete growth of a student. Garg Sports International believes in building champions in playground and assists sports industry by delivering high quality physical education or primary sports goods.